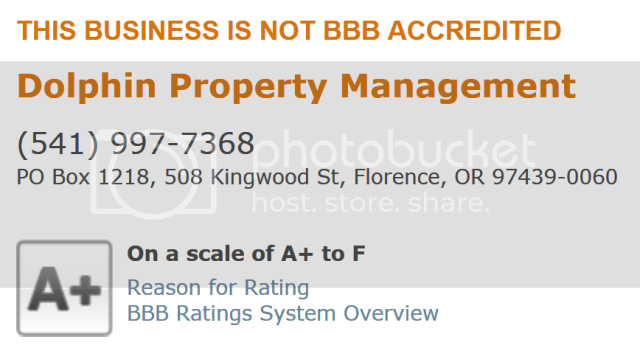 If you ever decide to rent an apartment in Florence Oregon stay clear of Dolphin Property Management and Chris Rupp the owner. When we moved into the property it was not even cleaned. When we left it was in move-in condition with maybe four holes for pictures needing patches. We scrubbed the bathrooms, sinks, fixtures, cleaned the ovens, swept and vacuumed. They even mentioned in their *****slist ad that the apartment was in move in condition on the 22nd of October. The funny part is that if you claim it's ready to rent why are you charging us for services after the date? Sounds like a scam to get the remainder of my deposit away from me don't you think? Here's how it broke down. I had a total of $950 in deposit held by Dolphin Property Management of Florence Oregon. I was told the garage door repair would cost $487 which left me $463. Then they charged me to replace a screen (which we did not break) on the sliding door which was $35 leaving $428. Next $8 for a lightbulb (expensive) leaving $420. He told me there was a mandatory $88 charge for cleaning the carpets (he really charged $148) which was never done when we first moved in leaving $332. Another garage door repair bill for $38 (which we already paid once) leaving $294. Then they charged a $99 cleaning fee which by the way my wife owned her own maid service and cleaning company and spent a whole day cleaning. It was left immaculate! $11 ding for normal wear and tear which is illegal to charge for in the State of Oregon leaving us $283.00. Dolphin Property Management sent us a check for $171. 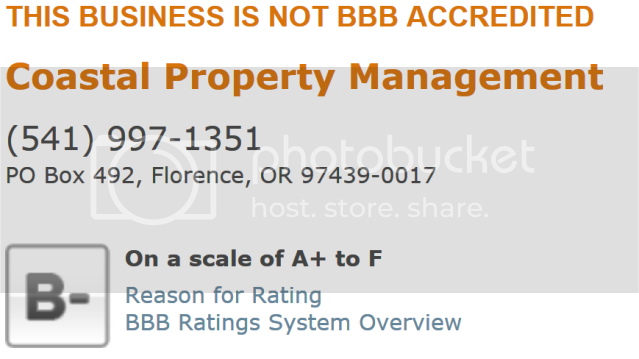 This is a warning to anyone who wants a property manager or is looking to rent an apartment in Florence Oregon. STAY CLEAR OF DOLPHIN PROPERTY MANAGEMENT!!! Thank you so much for the warning. I was about to schedule viewing a couple of their rentals when my wife checked for reviews. It only takes one review like yours to do it for me, but there were other similar reviews elsewhere, and one on *****slist posted yesterday 1/25/11 as well. Too bad so many real estate people are dishonest and disreputable. Honesty is still the best policy and I still believe honest people will succeed where people like Chris Rupp will eventually fail. Well, one can hope. Thanks again, and thanks to Scam.com for the forum to expose people like Dolphin and its owner. You are so welcome! What saddens me is that he even remarked that he had NEVER seen a rental unit that was so well taken care of. And we even gave him a beautiful solid wood TV stand because we had no room to pack it. All this over less than $200 dollars. Sorta funny. It would appear this review has already cost him some business. There are two sides to each story. I hope people reading this will remember that a disgruntled tenant may post anything he wishes including outright lies. We will provide references to anyone at anytime. We maintain a good reputation in a small town. You have the right to decide for yourself what kind of service you receive from us, without being told what to think. May I suggest that you not type your post in a larger font. It does not, in any way, make your message more important or true. Just kinda makes you look like a overbearing jerk. The report also shows a file opened date of 8JUL1997 (14 years ago) with no complaints in the last three years. This report shows a file opened date of 2SEP2010 (not even a year ago) and one complaint in April for 'Problems with Product / Service'. But, kamans7's last post was in January, 8 months ago and the complaint was only 4 months ago. Last edited by nomaxim; 08-17-2011 at 12:37 PM. THis is a very important and informative blog. thank you so much for posting this. many people will now be aware on the said scam. Last edited by nomaxim; 05-20-2013 at 07:13 PM. Reason: Removed spam link. Nice try Chris. Like so many rip off property managers I have seen in my life, the minute you know someone is moving 1000 miles away you take advantage. That is how ALL you scams make your real money! Everything I wrote was 100% true. On my sons life and with GOD as my witness. Apparently you do not serve GOD you serve mammon. Look in the mirror and you'll see a crook! ** the way. I was NOT disgruntled until you ripped me off! Who is the liar here? Chris told me the carpet cleaning was $88. He charged me $148. A lie! He told me that in Oregon there was no charge for normal wear and tear. He charged me $11 to fill a couple of holes. He charged me for a screen one of the contractors wrecked not us! He charged me for a second visit because when he ordered the NEW panels for the garage door he forgot to measure so they had to make a second visit. Once again, not my fault. And I am NOT telling anyone how to think Chris. I am warning them because you are a rip off! Plain and simple. This message has been deleted by mumbles. I can attest that DOLPHIN REALTY is the worst landlord ever and I may be suing them. They infested my equipment and stopped my film from being completed for at least 5 weeks. The cockroaches were invited from a missing obstruction between the interior walls of the place and the interior of the apartment. It has an exposed piece of the wall with nothing at all there, it's gross. So thousands of bugs pored in eventually. They got into the food in my refrigerator and into the hard drive of my equipment for work. They charged me for vacating though there was nothing wrong, they had the audacity to keep the whole deposit.I was sure to take VIDEOS of the place before I entered and when I left just to make sure they cannot lie. These people have cost me about $4000 so far in the last 5 weeks for rent, moving, applications to new places, etc. and for new equipment not to mention 22 actors being stopped in the progress of their careers due to the stoppage of my work from my computer. I had to deal with equipment being infested. On top of it all there's a bullying older woman who lives there who was bullying me and says she knows Elaine, the top person I guess at their office. This woman would sweep excessively and claim to be working to maintain it but she was a loud, controlling, insane bully who was eavesdropping and throwing her weight around a lot. She offered me food which I took once but I felt she might have contaminated it and told her to leave me the F alone. Brad Kamanski[/QUOTE] UPDATE: FAST FORWARD 2019. WE MOVED BACK TO FLORENCE IN 2017 AND IN 2019 WE HAVE FOUND A GREAT HOME! I WAS TALKING TO THE CONTRACTOR AND AFTER TALKING ABOUT MY EXPERIENCE YEARS AGO YOU WOULD NOT BELIEVE WHO IT WAS...IT WA CHRIS RUPP OF DOLPHIN MANAGEMENT. WE HAD A NICE CONVERSATION AND TALKED ABOUT WHY I WAS CHARGED THE FEES I WAS. I HAD NEVER HEARD THE EXPLANATION BEFORE AND AFTER OUR CONVERSATION I DECIDE I OWED HIM AN APOLOGY. HE WAS VERY KIND AND SAID WE WERE GOOD. I HAVE WATCHED HIM WORK IN OUR COMMUNITY AND I BELIEVE HE IS A STRAIGHT SHOOTER AND IT IS FINE TO WORK WITH HIM AND HIS COMPANY! I have seen a lot of negative reviews all over the internet, people are mad. AEWebworks, Boonex, Dolphin - SCAM? !